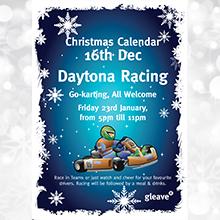 This Christmas we h ave created an Interactive Advent Calendar for our client Gleave. The aim of the calendar is to help the team get into the spirit of Christmas throughout the month of December rather than just a one night Xmas Party which inevitably not everyone can attend. Each day the team get a surprise ranging from; Christmas jokes, fun games – pin the red nose on Rudolph, a music quiz, pipe cleaner creation competition and much more. Each week there were special events & gifts including a fish & chips lunch for everyone complete with crackers & party hats, a box of chocolates, a winter car kit, pack of beer / wine and much more. Prizes for the competitions varied from high street vouchers, hampers and even a free day off work next year! The spirit of Christmas hasn’t been ignored and we have used the calendar to get staff to vote for their preferred charity to support next year. Furthermore we have promoted the activities planned for the New Year, as employee events shouldn’t just happen at Christmas but work more effectively to improve internal communication if carried on throughout the year. Each day people wonder what will be next and the calendar has successfully got different teams talking and competing together for a pro-longed period of fun! Internal marketing communications are just as important as external. Without a good time to live your brand values and communicate positively with your customers you won’t be able to maximize your marketing efforts. For creative & fun ideas that will get your teams working well together and support your business vision please contact us.